← A Bottle of Tokaji. When I was a boy, I took everything the Catholic church told me literally. After my first visit to the confessional, I was absolved of my transgressions by an old Irish priest who told me that, as soon as I said my ten Hail Marys, my soul would be light and unburdened by the weight of sin. When I had finished my last “Amen”, I ran outside to the church’s tetherball court and began jumping around the blacktop, convinced that with each leap, I rose higher in the air and therefore rose closer to God. It was a very good feeling. When I took Holy Communion, I understood that, thanks to the miracle of Transubstantiation, I was accepting an actual piece of Christ’s body onto the tip of my tongue. But which piece? I never knew. I didn’t dare ask the priest who was doling out the goods, so I’d just return to my pew and sit next to my mother with the Eucharist softening on the tip of my tongue. I never dared to chew the wafer, thinking it might cause Jesus unnecessary pain, so I just let it rest there until it dissolved, wondering if I could tell from what part of His body it came. Was it from His thigh or His breast? Was it light meat or dark? If I were to have judged based solely on flavor, I would have come to the conclusion that I was eating a part of His sandal every time. And yet I always found myself wanting to go back for seconds. We never ate before morning Mass, so I was always extremely hungry. When everyone else was praying for the souls of the recently departed, I was praying for breakfast. Ingesting the communion wafer may have brought me closer to Christ, but it also whetted my appetite as it found its way into my stomach and got my gastric juices churning. It was a uniquely Catholic torture. At Easter Mass, which felt like the longest of the year, I found this agony even more grueling, but entirely appropriate given the knowledge that Christ had suffered and died for my sins. I identified with Him because I maintained the deep, almost religious conviction that I was suffering and dying, too. Of hunger. I never understood why there wasn’t more food available during church services. Christ may have been good at self-sacrifice, but His true calling was catering. The Wedding at Cana. The Feeding of The Five Thousand. And wasn’t the central theme of Catholic Mass a celebration of The Last Supper? I hated to think that a man as famous as Jesus would have had a last meal consisting solely of a diet biscuit and a sip of terrible wine. I would look at the altar and think the priests could have done a much better job at feeding their congregation if they had set it up as a buffet. It was already set with silver and a nice cloth, so they didn’t have far to go. I never considered at the time what they might serve at such a buffet, but I was confident that whatever it was, they’d never run out of anything because Jesus would never let that kind of thing happen. Especially at one of his own parties. For the bible told me so. And quite literally, for that matter. If I were a church-going child today, I know what I’d like to see served at an Easter Service buffet. Everything would conform to a Jesus/Easter theme: Hot cross buns, chocolate bunnies, and cereal in the shape of crosses and halos; a knife-wielding deacon carving up the Lamb of God on one side, a seminarian offering up a ham of God on the other for those worshipers among us who don’t like lamb. And in the middle of everything would be a treat that would really bring home the drama of Christ’s Passion in edible form. 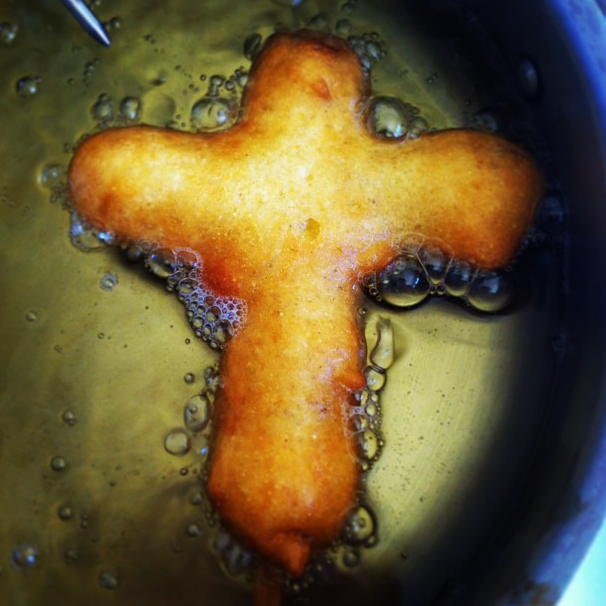 Something delicious and filling, but would still remind us of Christ’s suffering with each and every mouthful: corn dogs in the shape of a crucifix. They’re more substantial than a communion wafer, and more delicious, too. And, given the nature of hot dogs, you still won’t be certain from which part of the body they came. All that’s needed is the blessing of a priest to become a sacred part of a balanced church breakfast. With the Catholic church suffering a loss in attendance, even at Easter time, drastic measures should be taken to reverse the decline. Ordaining women, getting rid of the celibacy rule, and welcoming gay, lesbian, and transgendered would be nice, but I don’t see these things happening any time soon, so they might as well throw a nice, big buffet and see what happens. Or they might come up with some other novel approaches. All they have to do is ask the seven year-olds of their diocese because, as we all know, Jesus loves the little children. This recipe is adapted from Saveur magazine’s State Fair recipe, which was, of course, gotten from poor people who work state fairs, who got it from some other people, who most likely got it from wheat and corn crops. And cows. And mustard companies. The using-a-chopstick-as-a-handle trick I learned from Ree Drummond’s website. She most likely learned this trick from Beatrice Lillie’s character Mrs. Meers in Thoroughly Modern Millie. And Matt Armendariz will very likely be including this recipe in his upcoming Holidays On A Stick! cookbook (publishing date undetermined). If the idea of squirting a mustard Jesus onto your corn dog makes you uncomfortable, you can still stay in theme by creating a condiment version of The Penitent Thief. Or The Impenitent one, if that is more your style. Serves 8. To serve multitudes, pray over this recipe’s ingredients for as long as needed if you are perfect and without sin. For everyone else, multiply the recipe by hand. • 16 6″ hot dogs. I have chosen to use chicken dogs, which is more than likely still offensive to practicing Catholics on Good Friday, but probably less so than beef franks. • 4 pairs of wooden take-out chopsticks to serve as posts, 8 coffee stirrers to serve as crossbeams. 1. In a large mixing bowl, whisk together flour, cornmeal, sugar, baking powder, baking soda, dry mustard, white pepper, and salt. In a separate bowl, combine milk, buttermilk, and egg until the trinity becomes a confusing, inseparable muddle. Add the liquid to the dry ingredients until all becomes binding and Universal. 2. In a wide, deep pan or Dutch oven (this requires more elbow room than an ordinary, non-Catholic corn dog recipe), pour oil to a depth of 2″ and warm over medium-high heat until the oil reaches 350°F. 3. 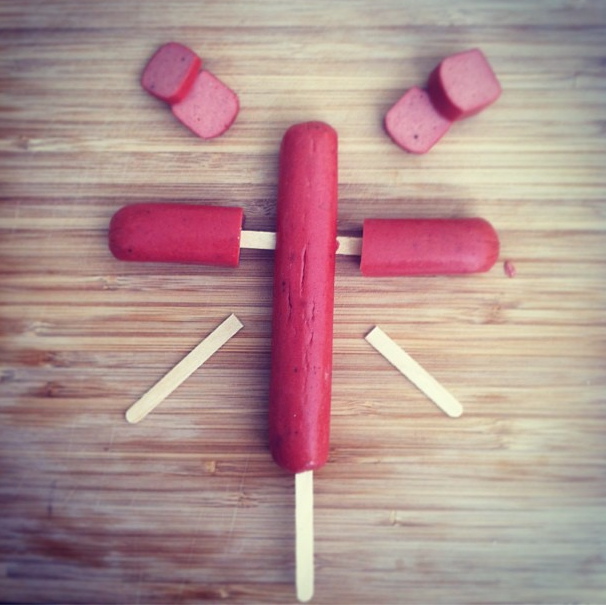 As the oil is heating, make the hot dog crucifixes. To assemble, cut about 2″ off the narrow part of each chop stick which, under ordinary circumstances, be the end one would place in one’s mouth. Discard the circumcised tips. Gently insert the chopstick into one end of a hot dog, until all that is left visible is a 2″ handle. Cut a second hot dog in thirds, discarding/sacrificing the center piece. These will be the arms of the cross. To attach, cut a coffee stirrer to the appropriate length and slide through the center of the top half of the whole wiener, then slide on the remaining 2/3 of cut wiener. (See photo*). 4. Dip one hot dog cross into the batter, coating well. The batter should be firm and giving, but not runny. If it is too dry, add a little milk. Too runny, add a little more flour. The batter is as forgiving as He is. Gently shake off any excess and lay directly into the pot of hot oil. Fry on one side for about 1 1/2 minutes. Using tongs, gently turn its other cheek and fry for the same amount of time. On the third minute, let it rise from the oil and rest on a shroud of paper towels to cool. Repeat until all crosses are battered and fried. 5. To serve, decorate with mustard. You do not have to put the image of Christ on every corn dog. If you have any martyrs in your family, feel free to squirt on their likeness and share it with them to show that you know how much they themselves have suffered, which will give them great comfort. Just please remind them not to bite into the coffee stirrer crossbeam, which most decidedly will not. * Note: This is a photo of a practice-run crucifixion dog in which I discovered that coffee stirrers are excellent for side beam support, but terrible for use as handles, which is why one should use chopsticks. This entry was posted in Holidays, Rants and Stories and tagged Catholics, corn dog recipe, Easter, jesus. Bookmark the permalink. Once again, you’ve made this lapsed Catholic girl’s day. I don’t know where to start but perhaps the ketchup wounds are my favorite. The mustard corona is a lovely touch. You could set up a little corndog Golgatha using one of those oh-so-chic cakepop stand gizmos. I like the way you think, lady. Perhaps I will incorporate the theme into my Mary Madeleines recipe photo. To say ‘I want one’ would be a lie, as I want two. The excellent thing about this recipe is that one is, in fact, two. Genius and hilarious. 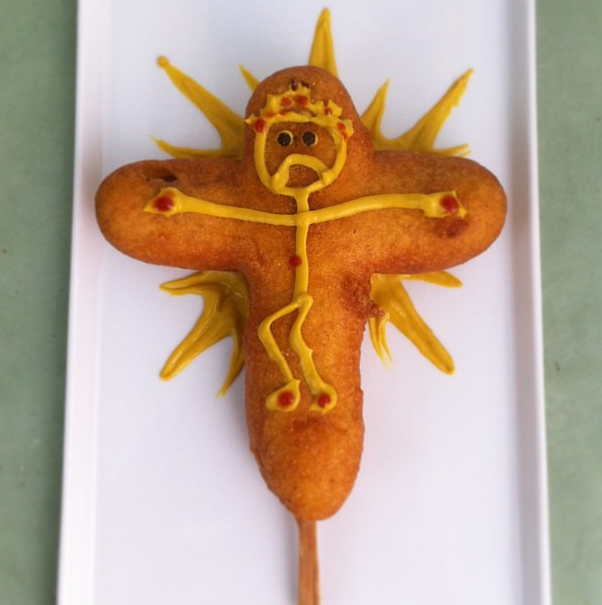 And I cannot imagine going through easter without a crucifixion corn dog. One of the charming things about this recipe is that you can plant these corn dogs upright in your garden on Easter morning to use as hidden egg markers for the wee ones. Or for children who are naturally terrible at finding hidden objects. I can only hope that our new Pope will make it one of his first orders of business to bless these corn dogs, and to absolve you of the sin of faking the Lord’s image in mustard upon fried dough. Go forth and write again, for you are hilarious in my sight. Once he gets around to fairly dealing with the church abuse scandals, allows women into the clergy, gets rid of the celibacy rule, and welcomes gays and lesbians back into the fold, then he can bless my dogs. You may go straight to Hell for this post but it would be worth it. Ginny, my own, personal path to hell is paved with much funner sins than Jesus corn dogs. Hilarious! That may very well be the best plating I’ve ever seen. Christ has a weakness for simple dinnerware. Nice work with the mustard and catsup. Your attention to detail is impressive! Thank you. The catsup was a last minute (possibly divine) inspiration. Yummy! I confess I want one! Say three Hail Marys and you may have one. Of course, you’ll have to say another ten for eating one. Well I was going to say “Jesus H Christ on a popsicle stick” but now I’ll have to say “chopstick”. Hilarious. I might just have to make these for Easter Sunday. It’s hard for heathens like me to know how to celebrate properly, but this seems right. Sometimes, it’s important to start one’s own traditions. I think this is doubly true for heathens. I’ve been sitting here trying to craft my comment into something worthy of posting – however I’ve come to terms with the fact that I’ll never be quite and witty or eloquent so here goes my blathering. This post really spoke to me. As a former-Catholic I think this is utterly brilliant and a bit naughty – but this isn’t new news is it. I too took everything that the church and my staunchly Catholic mother said literally – so much so I’m still afraid of the dark because there’s demons at the foot of your bed waiting to drag you down as you take your last breath… With that note, I wish you a Happy Easter! I’ve been sitting here after a long Easter weekend away with my lovely family, but slow wifi, horrified that it has taken me so long to get to your comment. I still have a hard time letting any part of my body dangle over the edge of the mattress, too. For much the same reason. However, if you curl into a tight ball under the covers in the EXACT of your bed and count to twenty after shutting off the light, the demons’ power is destroyed. Didn’t anyone ever tell you that? And Happy (Belated) Easter to you, too. Straight to Hell, Mr. Procopio. Straight to Hell, but with every Catholic, lapsed and non, applauding you every step of the way. This is one fine piece of writing. It brought back lots of memories – the Sunday AM hunger bit, and the serious wonderings of overly thoughtful children everywhere who took great care with those wafers, ever mindful that we really did not know which part of Christ’s body sat so precariously upon our tiny tongues. You definitely deserved that nomination, and you deserve to win! Thanks, Adri, for the wonderfully kind words. The road to hell, I believe, is paved with good blog posts. I’m quite surprised this post hasn’t incurred more human wrath. I’ll just have to try a little harder next time, no? And I love anyone who loves me, which is odd because, historically, that is not how my romantic relationships work. And I thought the dog I encased in dough to make it look like a weiner dog was good. This is fantastic. Can’t wait to enthrall the nieces and nephews with this gem. Thanks as always for the funny posts and great ideas. I am just grateful that people think my posts are funny and my ideas great. Also, please send photos of dogs encased in dough. Especially any you might find of Great Danes of French Mastiffs. What strikes me most, is how the posture of your mustard messiah evokes that of Terrance Stamp in “The Adventures of Priscilla, Queen of the Desert”. Specifically, the emu costume portion of the “Finally” number. Or maybe that’s just my own memory’s peculiar way of relating things. Either way, I love it. They say that every idea has to come from somewhere. Perhaps Mr. Stamp’s performance in said film was filed away for later use upon viewing. I have not only adopted this posture for my mustard garnishing, but also as one I myself use for when I am discovered sleeping beautifully and peacefully upon my bed by my lover as he enters the room with my morning breakfast tray. I can’t stop laughing, and I shouldn’t even be perusing blogs at work. “If the idea of squirting a mustard Jesus onto your corn dog makes you uncomfortable…” is going under my file of “sentences that have never been said before.” Another hilarious post! Thank you, Ashley Bee. What sort of monstrous employer doesn’t let you peruse blogs at work? On second thought, the idea of surgeons and firemen and hotel room service employees perusing blogs at work makes me rather nervous. Perhaps its a good thing your employer doesn’t let you do it, either. It saddens me that I am too scared of frying to actually make these at home. Fear of Frying? If you need help getting over this fear, I am a charter member of the Mile High Fry Club. I will be gentle. If I were able to attend Easter mass at St Peter’s Square, I think I should probably find myself standing in line instead, waiting for my Crucifixion Corn Dog! I hope to G-d that someone does set up a crucifixion corn dog cart in St. Peter’s Square. If anyone who buys one feels as if they have transgressed, he or she could simply pop into the gift shop and purchase an indulgence. The church lady who lives inside of me gasped, but then who am I to judge your corn dog religious experience? I had to giggle, you are a doll. Lovely to meet you at potluck, best of luck on your award. The church lady who lives in side of me merely rolled her eyes and then offered me a doughnut, which I immediately accepted. Next time we meet, I’ll try to bring some cocktail onions. Will have to plant some. Apologies for not responding sooner, but I’ve been overwhelmed. Ironically, with blog-related stuff. A choir director? We could have used your services at the potluck. Also, I bought four avocados yesterday and thought of you. If you’re happy, I am happy. you’re hilarious michael..i had to read your post twice in case i missed any of your witty and/or clever gems..i did miss the egg ‘flogging’ on the first read..
i discovered catholicism when i was 12 (sheltered upbringing) because i fell in love with a not so good catholic boy..i didn’t lust after him..i was late to develop in that department..but i did lust after a rosary when i found out about them.. I still have one of my rosaries, but it’s been ages since I’ve fondled it. But I am deeply pleased that you read this post twice. I can’t think of another post I had more fun writing. Oh my god, thank you for the laughs. This is AWESOME!! Trying to explain communion and theology to my kids is maddening and they make comments like your above expressed thoughts. I just shake my head. Now if I could just get them to like hot dogs…. Kiki– You are most welcome. I’m glad to know I wasn’t the only child who felt this way about Holy Communion.